We began our morning early in our beautiful palace parlor only to discover that the milk that we bought yesterday for our cereal and coffee was buttermilk...we couldn't read the label but it was in a case at the grocery with cartons that looked like milk. Maybe the housekeeping staff will enjoy it after we leave. We really wanted milk for our coffee and cereal. The hotel called us an "honest" taxi that took us to the train station for 280 crowns rather than the 980 we spent to get there....100 crowns is equivalent to $6.00 US dollars. We bought our train ticket for Kunta Hora, and got on the right train for about an hour ride east. A couple who took my cathedral class at the College of Southern Maryland two years ago had brought me a model and a book from St. Barbara's cathedral in Kunta Hora. I have made the model, and we wanted to see this amazing cathedral in person. The discovery of rich silver ore deposit in the second half of the 13th century sparked an economic boom in Kutna Hora that turned this sleepy miners’ settlement into the second-most important town in Bohemia, rivaling Prague in terms of economic, political and cultural importance. King Wenceslas II declared it a royal town in 1307 and the Royal Mint, established in Kutna Hora a year later, went on to produce roughly one-third of Europe’s total production of silver. As the town’s wealth grew, so did the number of grandiose palaces and churches. Things started taking a turn for the worse at the beginning of the 16th century. The gradual depletion of ore deposits and the destruction cause by the Thirty Years’ War were the industry’s final death blow, leading to the closing of the Royal Mint in 1727. Today, Kutna Hora remains one of Bohemias most popular day-trip destinations thanks in large part to its charming historical center which joined UNESCO’s World /Cultural Heritage List in December 1995. We walked about a mile from the train station in Sedlec which is a small town adjacent to Kutna Hora. 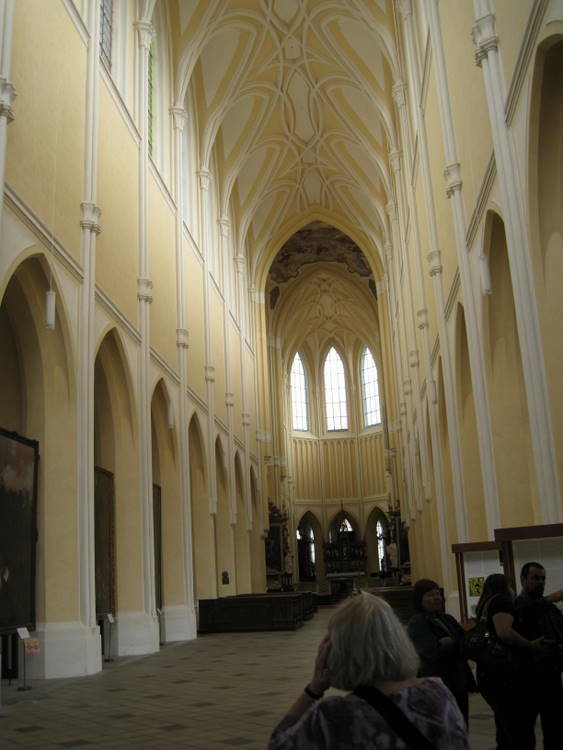 We passed a beautiful, very large church – Church of the Assumption of Mary and St. John the Baptist. We wanted to stop at the tourist office first. Right up the street from the tourist office was what was known as the “Bone Church.” We had read about it, and decided that we really didn’t want to see it, but being this close we decided to venture forth. 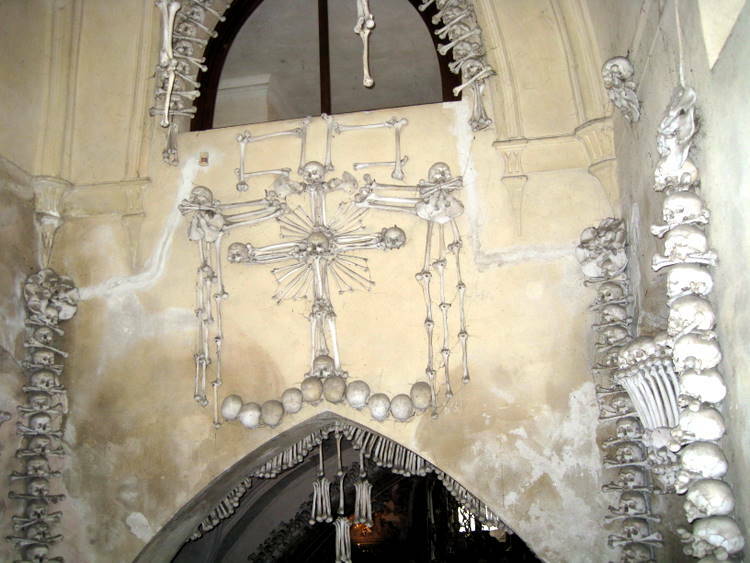 The Bone Church is a rather macabre chapel decorated with the bones of about 40,000 people. The story began in 1278 when King Otakar II sent Henry, the abbot of Sedlec, on a diplomatic mission to Jerusalem. Henry returned with a small amount of earth taken from Golgotha and sprinkled it over the cemetery of Sedlec Monastery. The grounds were declared holy and the cemetery grew in fame throughout Central Europe. Soon it became the most sought-after burial site of the powerful and wealthy. The bodies began piling up during the plague epidemics of the 14th century and the Hussite Wars in the 15th century. T his prompted the building of an underground chapel that was to be the final destination of the ever increasing number of remains. When the Schwarzenberg family bought the monastery in the late 1800s, they hired local woodcarver Franisek Rint, who found a solution to the huge number of century old bones. 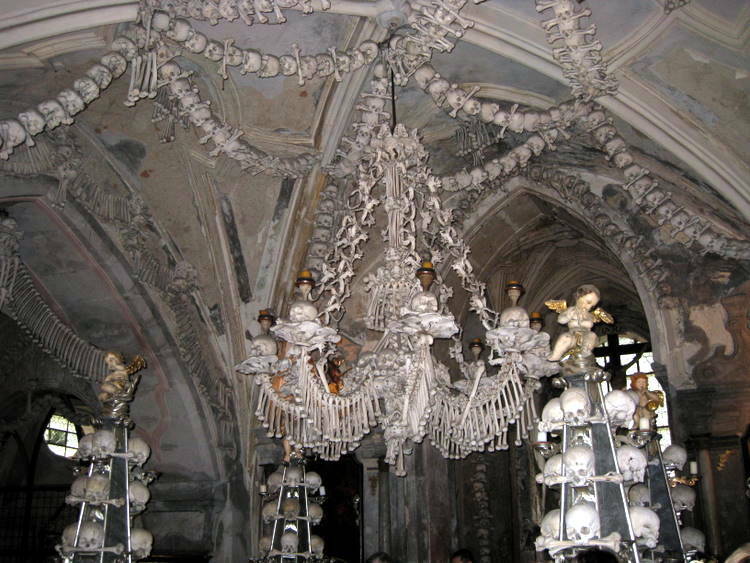 The remarkable collection of bones were arranged into crosses, columns, chalices, and monstrances, as well as giant bells in each of the chapel’s corners and an enormous chandelier in the center of the nave containing every bone in the human body. To say the least, it was rather weird. They did allow photography. We walk back down the street past the tourist office to the Church of the Assumption and St. John the Baptist. 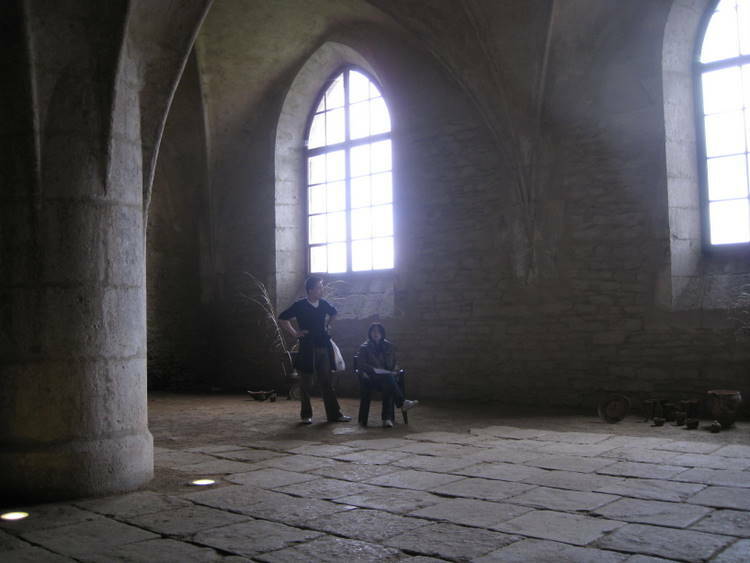 The origin of this church is associated with the medieval expansion of the Order of Cistercians from France through Germany to Bohemia, where their expansion continued by the establishment of a Cistercian abbotship at Sedlec. There on the site of the original monastic church, a huge Gothic church was erected in 1290-1320. 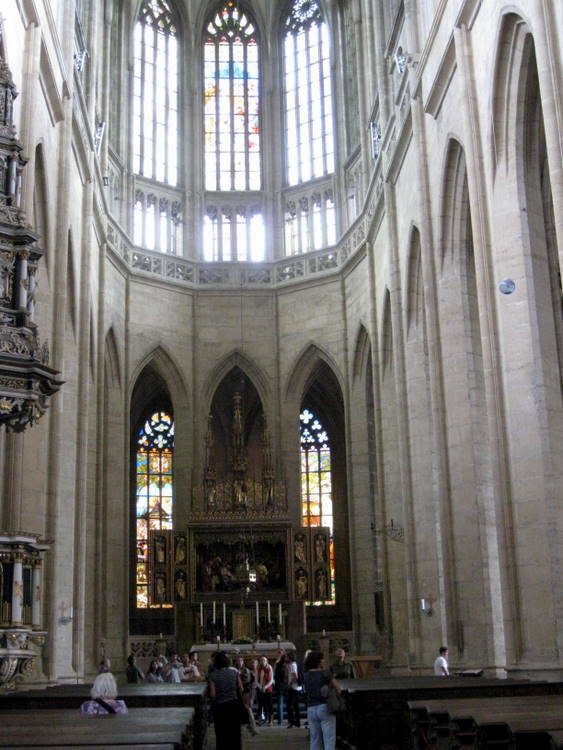 It is the oldest example of Gothic cathedral architecture from North France in Central Europe. This church was burned down during the Husssite revolution in 1421. Most of the five hundred monks who tried to defend the monastery were killed, probably inside the cathedral as indicated by skeletal findings in the alcoves in the northern wall. The legend says that Hussite commander, Jan Zizka, ordered to spare the church, but one of his officers did not obey his order and set the cathedral on fire. The commander rewarded him accordingly. He was ordered to melt gold and silver and pour it into his throat. After this tragedy the monastery’s assets were forfeited and the church remained in ruins for the next 278 years. 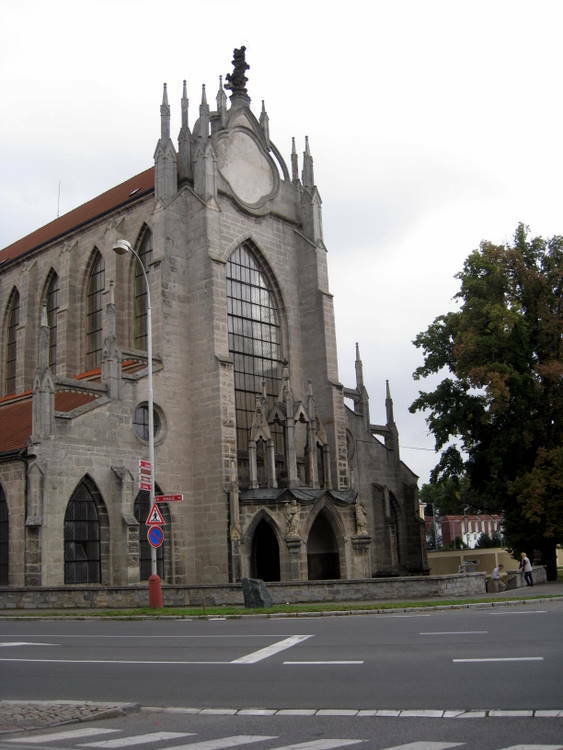 The church was restored in the early 18th century by architect Jan Blazej Santini Aichel in the new Baroque Gothic style. 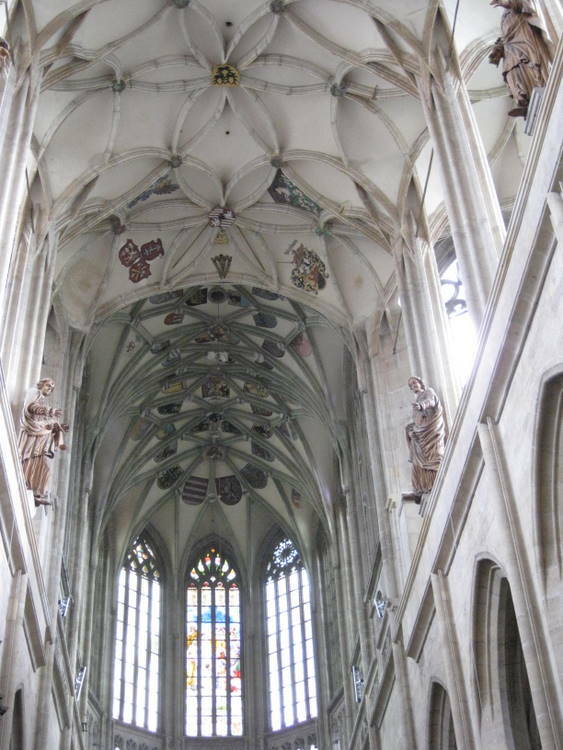 The vaulting of the nave was decorated with a network of circular ribs. The imposing architecture is integrated with Baroque decoration, which was created by the most important personalities of Central Europe. 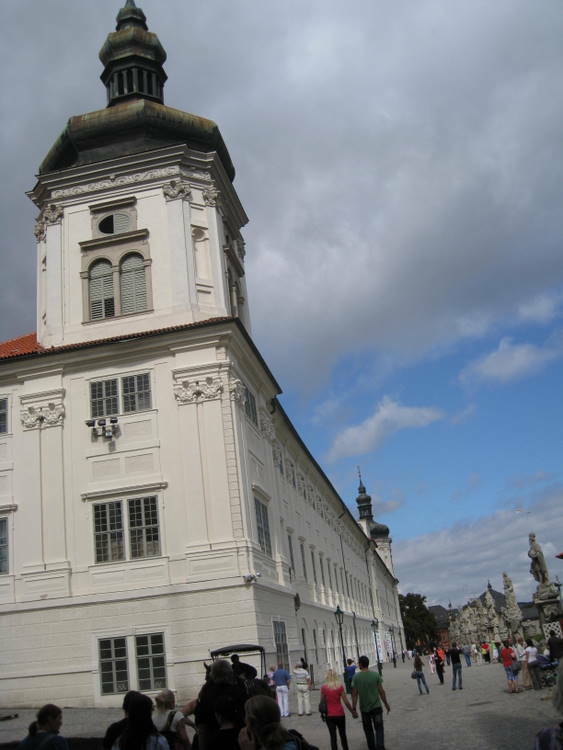 The building and its furnishings were a heavy burden for the monastery’s cash, and after the last abbot died, the monastery was managed until it was abolished in 1783 by Joseph II. 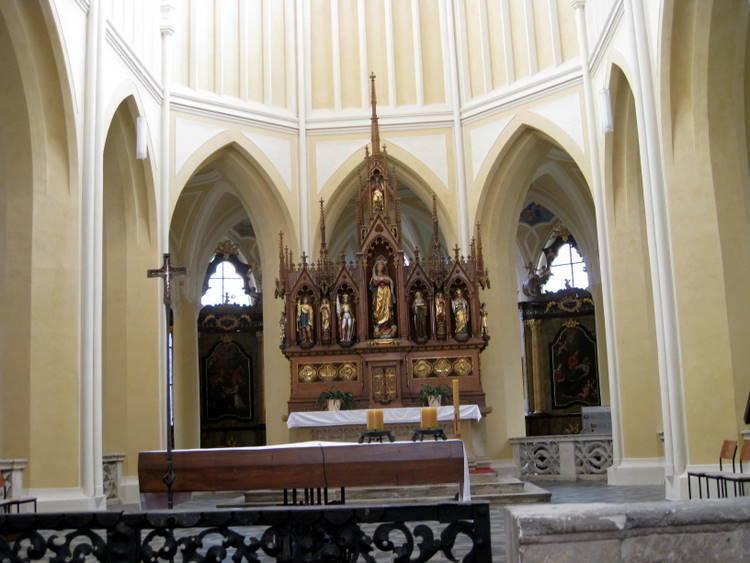 This was a disaster for the carefully and expensively created interior of the church. Those things that could be moved were sold in auction, the church closed down and deconsecrated. It even used as storage for flour. The cathedral was re-opened in 1806 as a parish church, and the monastery was rebuilt. The last repair and renovation took place in 2001-2009 when the church was re-consecrated after three hundred years, and restored to its original purpose. The interior was in a beautiful cream/yellow color accented by white columns and molding. The day was bright so the interior was well lit. There were no stained glass windows. The ceiling vault was really magnificent. In the vault of the great crossing was a fresco depicting the Holy Trinity. There were chapels with beautiful artwork around the apse. vVery few people were visiting while we were there. It was a good spiritual experience. 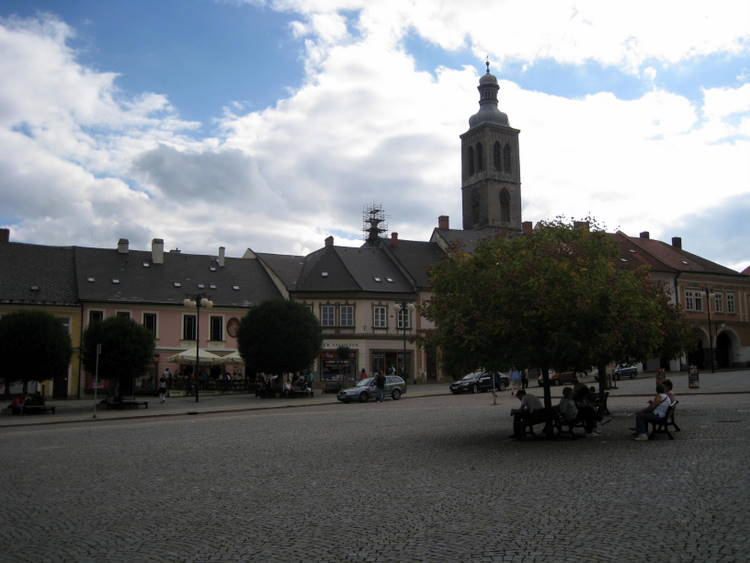 This part of town, Sedlec, was some distance from St. Barbara’s Cathedral. We went back to the tourist office to ask about transportation to St. Barbara’s. There was a bus which didn’t run too often on Saturday. He sugge sted a tourist van which could be found outside the gate of the “Bone Church”. We walked back up and found the van but no driver. She was in the “Bone Church” and was happy to give us a ride. She let us out in front of St. Barbara’s. We were hungry and found a wonderful little old neighborhood restaurant down a block and across the street – Restaurace Sance. The sign said they had been there since 1573. We ate in an outdoor area which was stone on three sides and open towards the entrance. It was very quaint. I had fish and my wife had chicken. The food was good and it was fun to be eating near a group of elderly locals who were celebrating something. Named after the patron saint of miners, St. Barbara, the cathedral of St. Barbara is one of the world’s most remarkable examples of Gothic architecture. 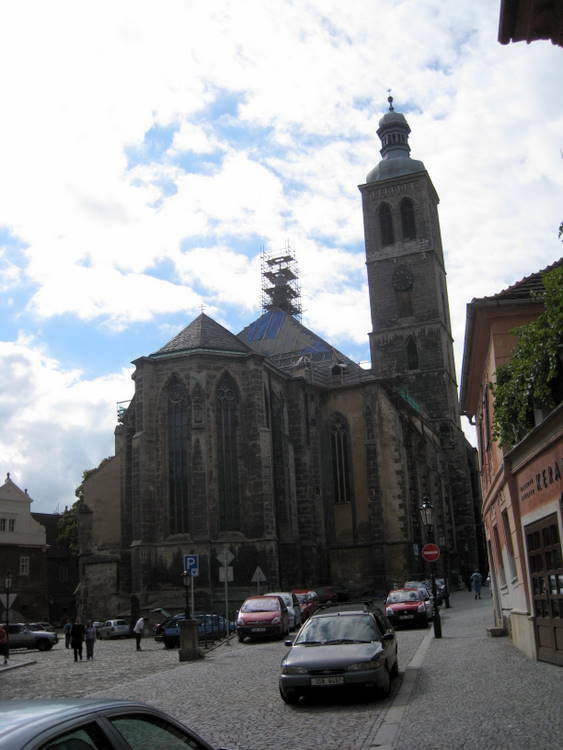 Based on the initial designs of Peter Parler (who also designed St. Vitus in Prague), construction began in 1388, but was interrupted for an extended period of time due to the Hussite Wars. Work on the building was completed in 1558. By then the silver mines and money began to run out. Means for the further furnishing and maintenance of the cathedral were lacking. During the Thirty Years’ War (1618-1648) many of its articles of precious metals were stolen, sold and used, among other things, for the minting of coins. 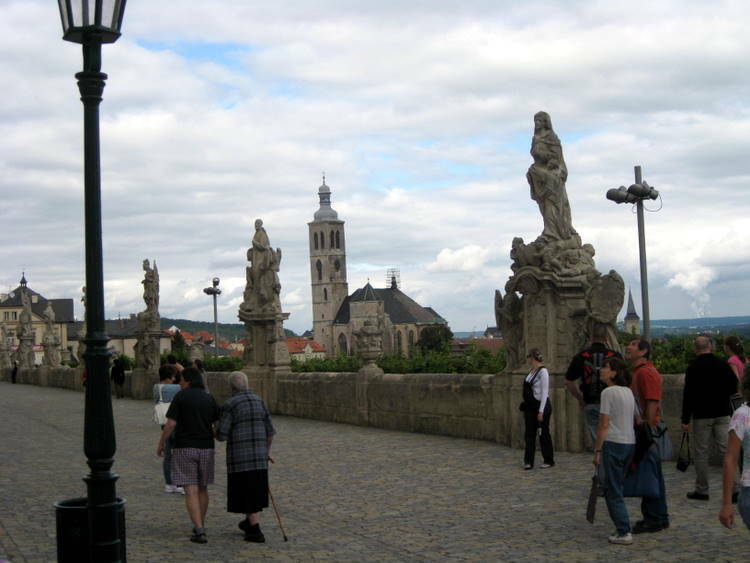 In 1626 the Jesuits arrived in Kutna Hora and placed St. Barabara under their administration. They began to carry out building modifications. 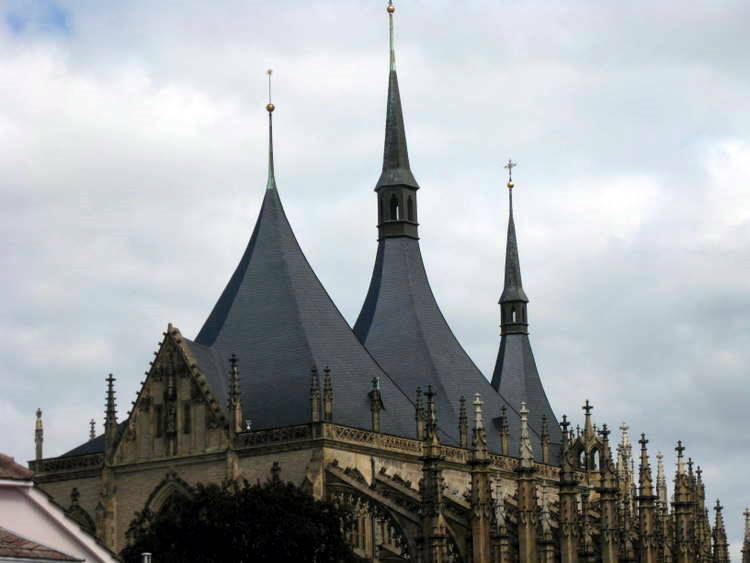 The most striking Baroque transformation was the replacement of the tent roofs with a saddle roof with three turrets. 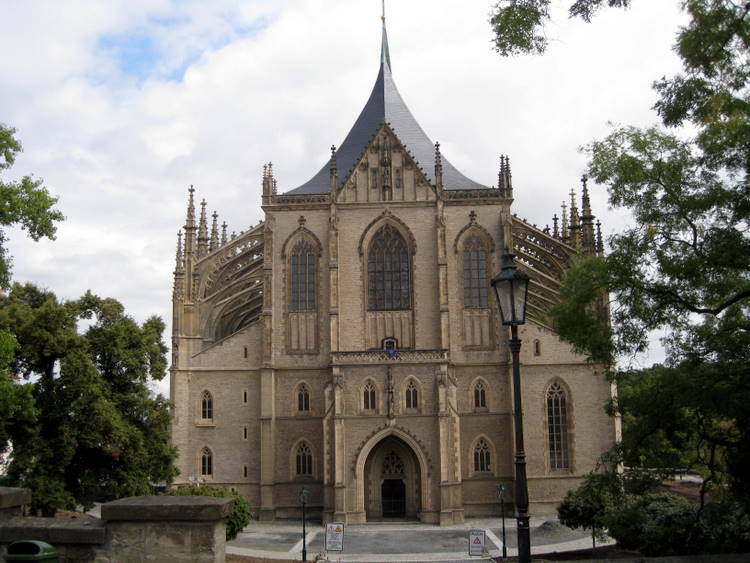 Their a ctivities came to an end in 1773 with the departure of the order from Kutna Hora. The church began to fall into decay. In the 1870’s a society was formed for the restoration of St. Barbara’s. The Baroque modifications were liquidated as well as the greater part of the furnishing. Gothic elements were renewed. In the 20th century the cathedral regained the three tent roods and west façade was extended. From the restaurant, we could see the three tent roofs of St. Barbara’s. Going back up the street, we arrived in front of the church which was located much lower than the sidewalk. We stopped to take photos. 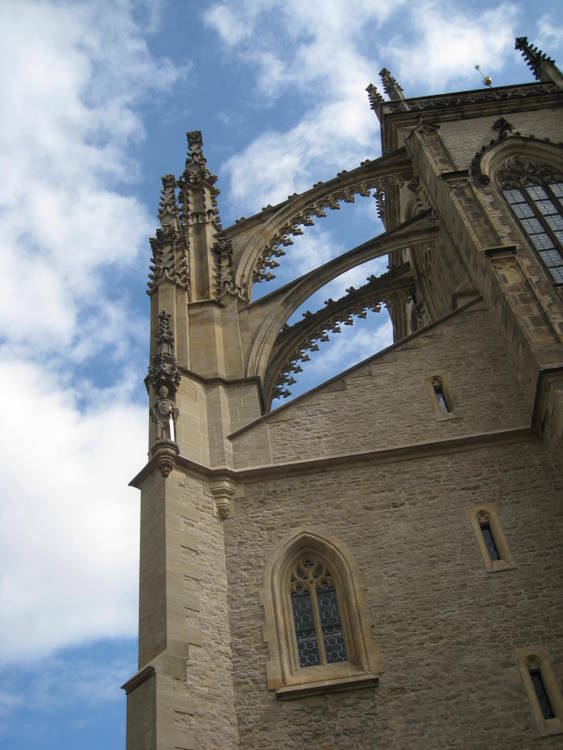 Having built the (SEE MY MODE ), I was familiar with all of the flying buttresses and other exterior c omponents. The west façade is rather plain with a center entrance door flank by small windows on each side, four small windows above the door. The second level consists of a large central window with a smaller window on each side. Work was being done on the terraces leading from the street level to the plaza in front of the church. The main entrance was through the north transcept. Just as we were ready to go in three old airplanes did a number of maneuvers over the area. The inside was spectacular especially the ceiling. We had seen photos plus a Teaching Company lecture which highlighted St. Barbara’s ceiling. The style is known as Helical Vaulting. The center section of the vault has the appearance of a number of six petal flowers. The vaults are covered with emblems representing guilds, fraternities, important persons and the names of the Sacraments and Virtues. Around the exterior wall and in apse are small chapels. Above the Neo-Gothic high al tar are windows with only the center being stained glass. Overhead in the nave are four large statues representing Justice, Bravery, Caution and Temperance. 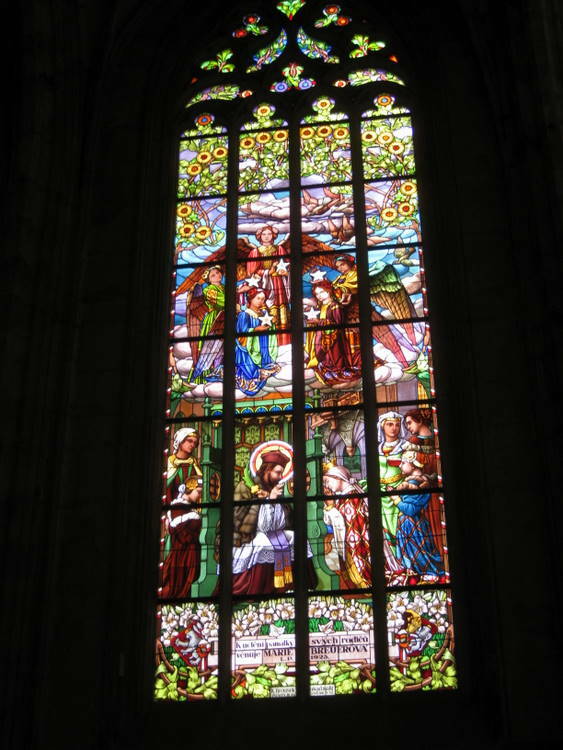 There were large stained glass windows at the nave level which were made of brilliant colors. The sun was shining which made them even more spectacular. As we left, I stopped at the small gift shop in the transept. I didn’t see any models of the church like I had. They told me they were no longer published. I am so fortunate to have one. We went back outside where I took more photos. There were wonderful gargoyles. The back of the cathedral was on top of a rather steep cliff with the town below. Next to the cathedral was the Chapel of Corpus Christi. This inconspicuous structure was there before the construction of St. Barbara’s Cathedral. 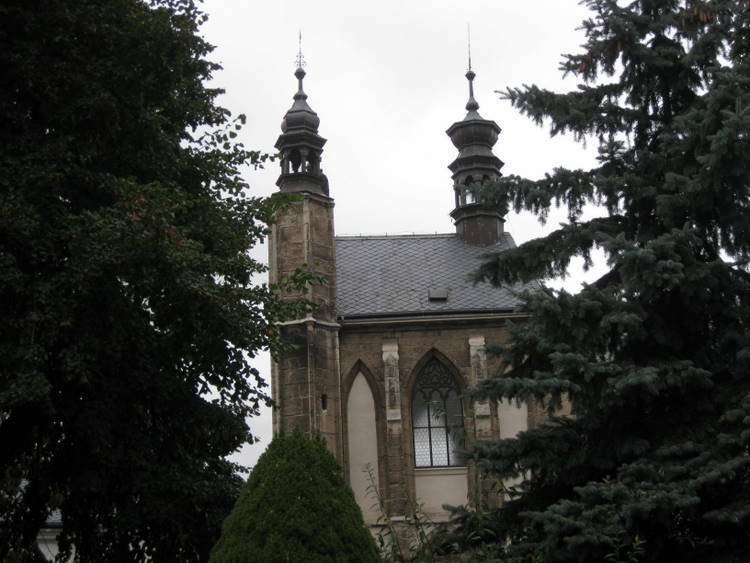 At that time, the Brotherhood of Corpus Christi established a cemetery chapel with an ossuary inspired by the “Bone Church” in Sedlec. There was a small door that led to a steep set of stairs leading down into a large hall. 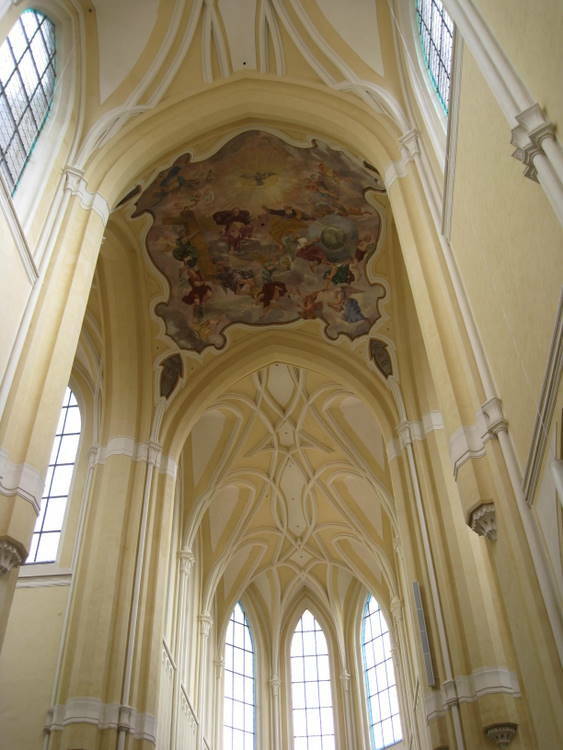 The chapel remained in the original shape until the arrival of the Jesuits who, in connection to the construction of the Jesuit College, initiated a series of reconstructions resulting in a new entrance with a Baroque portal. Upon the exodus of the Jesuit order, the Chapel of Corpus Christi was transformed to serve as an organ workshop and soon began to decay. In 1997 – 2000, the entire structure was subject to major reconstruction and nowadays it is accessible for public and used for small cultural events. We went down and observed several displays of pottery. On the opposite side of the walkway was the Jesuit College. It was built between 1667 and 1703. It was designed in an F-shaped ground plan to remind people of the Habsburg kings Ferdinand II and Ferdinand III. The front façade resembles Italian palaces of the early Baroque period. The artificial terrace in front of the College was enclosed by a low wall with 13 sculptures of saints favored by the Jesuits, including St. Ignatius of Loyola, St. Wenceslas and others. It was designed as a resemblance of the Charles Bridge in Prague. We decided that we would walk down to visit St. James Church. It was rather steep with the street covered with cobblestone. The views were beautiful and the walk charming. We came to St. James church but it was closed for renovation. Its construction was initiated in 1330 by German patricians and supposedly also by minters and coiners from the adjacent mint in the Italian Court who wished to have a church nearby. The main core of the church was completed around 1380 with architects from Peter Parler’s workshop taking part in the designing of the western façade, but construction works continued until 1420. Further down the hill, we came to the Italian Court. The origins of the Italian Court are shrouded in mystery and historians can only guess because no written resources and only a few artifacts dating from the earliest history of the building have been preserved. Presumably there was a little fortified castle that was later chosen by the sovereign to become the seat of the new Central Mint. Since the very beginning, the Italian Court was separated from the town by fortified moats to protect the workshops, in which silver was processed and coins were struck. 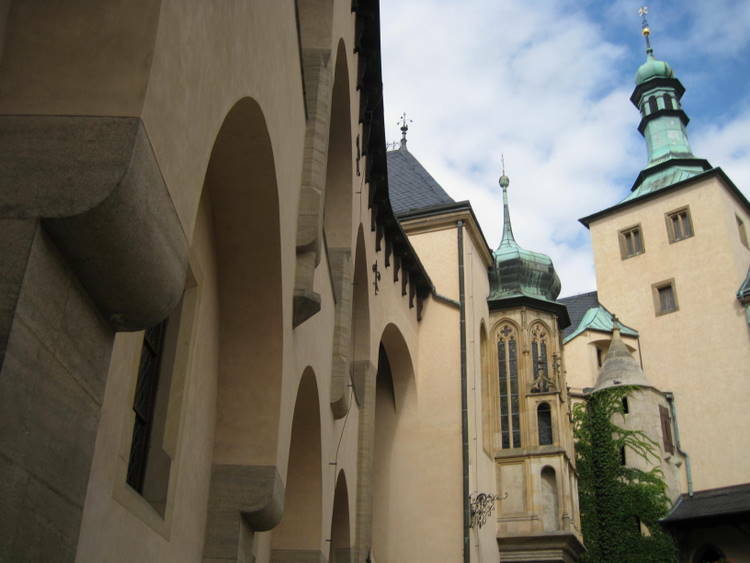 The original building was reconstructed at the turn of the 15th century, allegedly upon the request of King Wenceslas II, and the chapel and the royal palace were added. The Italian Court thus remained virtually unchanged until the end of the 18th century, when the mint and the mining office were abolished and the building began to decay. A century passed and the condition was critical, some people even called for its demolition. Eventually in the 1880s, municipal authorities decided to carry out a vast reconstruction project under the direction of the famous architect Ludvík Lábler. The project involved the removal of ruined workshops; what remained were the royal palace, the treasury and the chapel that was redecorated in the Art Nouveau style. We didn’t have time to go in but we sat in the courtyard for a while. It was very peaceful. On the front was a small café but we had decided that we wanted ice cream which they didn’t have. So we walk a little farther and were soon in a large plaza with a number of cafes. We found an attractive outdoor café that had a wonderful ice cream menu. We were really “bad” but it was sooo good. We had planned on catching the 5:00 PM train back to Prague, and weren’t sure how long the taxi ride to the station would be. We had noted taxis near where we had the ice cream so decided to take the taxi back to the train station about 4:15. At the train station, we sat on a bench on the platform. It was a very small station. The quietness of the wait was very relaxing. At times there was complete silence. Around 5:00 pm people started arriving and it got noisy. We were supposed to catch the 5:00 PM train but it was about 25 minutes late. On our trip to Knuta Hora we shared a compartment with woman who could talk to us in English although they spoke to each other in Czech. They had been helpful in giving some directions. We went back to Prague on the same train with them, and we shared the same compartment again. 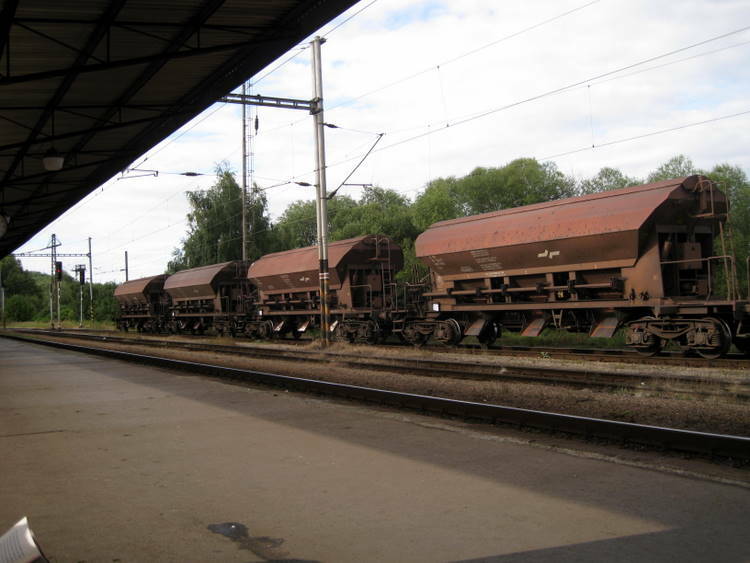 Not only was the train late to begin with, it broke down on the way back to Prague so they had to put on a new engine. It was 6:45 when we got back to Prague – 45 minutes late. We had forgotten to bring our Prague maps and we weren't going to get robbed again by the yellow cabs. We found a hotel across from the train station and the desk clerk told us how to take the tram back to our hotel. We hadn’t made any dinner reservations. The wonderful restaurant in our hotel was booked for a wedding party. We had remembered seeing a restaurant on the street behind our hotel that had a Trip Advisor ad on the door. It was booked for the evening. We went back towards our hotel a few feet and found another restaurant in the Hotel Leonardo – Platina. 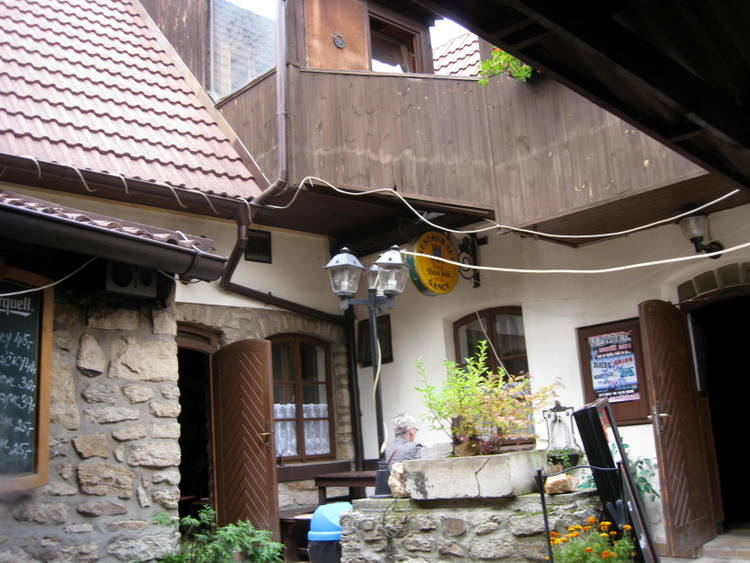 Part of the restaurant an open air courtyard. We sat in the courtyard. The evening was called a barbeque dinner. The menu consisted of a number of delicious looking items to be cooked on the grill in the courtyard. There was an extensive salad bar in the next room. Live music was provided by a fellow who played the piano and sang…even a few old American favorites. My wif e had trout, and I had a beef, pork and chicken shish kabob. I couldn’t eat all the beef as it was very tough but had a good flavor. It was a fun place to eat. When we got back to the hotel, the wedding dinner was nearing completion. 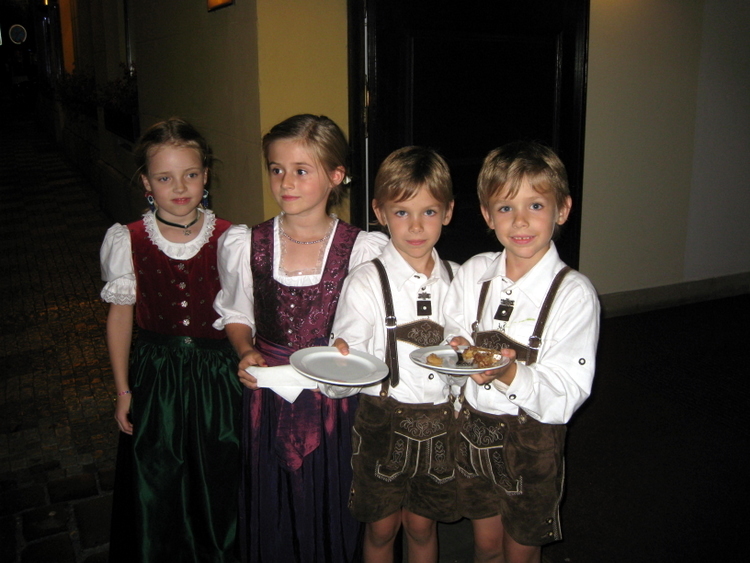 At the entrance were four beautiful little children – two boys and two girls – dressed in the traditional dress offering us plates of desserts from the wedding. They even supplied a fork. It was a long but very enjoyable day.